iRail 2017 will be held at Pride Park stadium, home to Derby County Football Club, on Tuesday 14th March. Education Outreach Day in Each School: Opportunity to Sponsor Your Local School! This year all participating schools will benefit from a day’s outreach activity prior to the main iRail day. This means we will reach almost 20 times more students than previously. 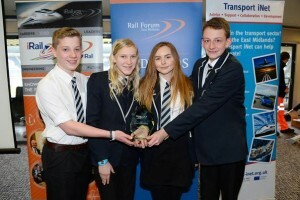 The school sessions will raise the profile of rail (in the broadest sense) and set the scene for the challenges that will be tackled by the school teams in March. 9.00am – 3.30pm iRail STEAM (Science, Technology, Engineering, Arts, Maths) Challenge involving teams from 13 schools from across Derby, Nottingham and Leicester. In addition to the STEAM challenge the day includes visits to Bombardier and East Midlands Control Centre. There are also opportunities for organisations to exhibit and showcase their products and services during the day with a particular emphasis on raising the profile of their organisation and its activities to potential future recruits. Running alongside the main iRail event we will also be hosting a teacher’s rail industry awareness workshop. Teachers are key influencers of young people and are often the first source of careers advice. Our short workshop will help to educate teacher’s about the 21st century railway and the jobs and careers potentially available to their students. iRail is RFM’s flagship rail specific outreach programme. It is an expensive event to run every year and we need ongoing support and sponsorship from as many members as possible to be able to continue to offer this fantastic event to our local schools.